The new owners of Terminus Pyrmont are set to reopen the pub next week, after it had sat abandoned for three decades. Co-owners David Mathlin and Binu Katari purchased the long-dormant pub in early 2016, and employed the services of award-winning designers Luchetti Krelle and heritage architect Garry Stanley to reawaken the pub. The venue has a long and colourful history, having been first licenced on Christmas Eve in 1841. In the last 150 years it has been the local haunt for revellers, gamblers and members of Sydney’s underbelly. With its famed ivy covered façade, the new design of Sydney city-fringe pub pays tribute to its history with lush textures and alfresco outdoor spaces. “We have a longstanding connection to Pyrmont and have spent the last two years reviving the Terminus to bring it back to its former glory in a way that genuinely resonates with the community. Locals will immediately notice the distinctive spaces, each with their own occasion, personality and charm,” stated Mathlin. In the new design the public bar retains pride of place at the entry of the hotel, and will serve a selection of craft and mainstream beers, alongside ‘The Terminus’ lager, brewed by Endeavour. Boutique private dining rooms have been created to serve a variety of large and small functions. An expansive sandstone courtyard with remnants of the old ivy vines provides a shady spot for those wanting to sit outside, while upstairs Vera’s Cocktail Lounge spills out onto a terrace with a retractable roof. 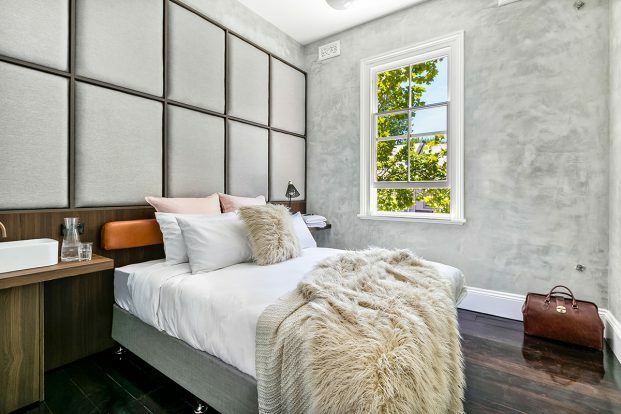 The new Terminus Pyrmont also offers boutique accommodation, with nine double rooms – two of which have private ensuites, with the others sharing bathroom access. Leading the team at Terminus Pyrmont is general manager Belinda Clarke (ex Jamie’s Italian) and head chef Bektas Mustafa Ozcan (ex Chiswick). The menu at Terminus Pyrmont will be a mixture of Mediterranean share plates such as slow roasted oyster cut lamb shoulder and grilled sumac cured calamari; and pub classics like fried flathead with chips, and the Terminus wagyu burger. The Terminus Pyrmont will likely re-launch next week. A book, The History of Terminus Hotel, by Shirley Fitzgerald, will be launched on the same date, and will be available for purchase in the venue.